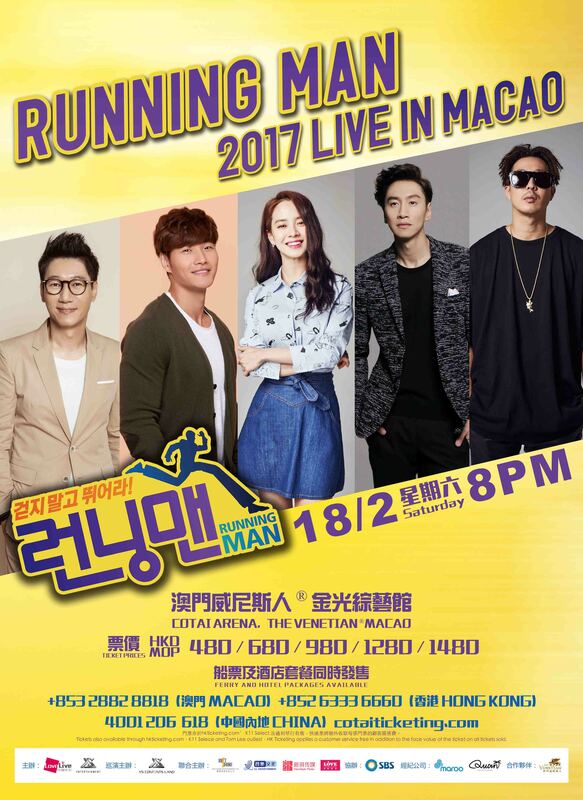 (Macao, Feb. 1, 2017) – Stars from South Korea’s ever-popular reality show Running Man are bringing Running Man 2017 Live in Macao to entertain fans at Cotai Arena at The Venetian Macao on Saturday, Feb. 18. Ticket prices start from MOP480 and go on sale today at all Cotai Ticketing box offices. Fans of the hit variety show are in for a treat, as its stars, including Song Ji-hyo, Lee Kwang-soo, Kim Jong-kook, Ji Suk-jin and Haha are coming to Macao as part of the Running Man 2017 Asia tour. With all-new performances and sets, the Running Man stage show is sure to dazzle audiences. Alongside the usual games in which regular hosts and celebrity guests compete in tasks ranging from obstacle courses to quizzes, audiences can expect the wacky humour and banter which has made the show such a success. Fans will also be able to discover the hidden musical talents of the group when they perform some of their favourite songs. Created by SBS in South Korea, Running Man has been described as an “urban action variety” in which guests join regular hosts to complete missions at various landmarks in order to win the final race. Featuring high-profile guests such as international action star Jackie Chan, the show has become hugely popular in South Korea as well as other parts of Asia and around the world. Date and Time Feb. 18, 2017 (Saturday), 8 p.m.
For information about upcoming shows and events, visit https://www.venetianmacao.com/entertainment.html.